I’m in the processing of copy editing a 1,000-page textbook that is due in two batches. I’ve already sent in the first batch of chapters, and as I’m editing the second batch of chapters, I’m coming across errors I missed in the first batch. I’ve already sent a list of close to twenty errors (although some were related, such as the same word misspelled twice) that I missed to my project manager, but I’m still coming across more. Another person is doing the proofreading for this project so I won’t have the opportunity to fix these mistakes myself. Is there a certain number of errors, perhaps based on the number of pages, that copy editors miss and that is expected? This is my first project with this company and my first time editing a text of this length. I don’t want my project manager to think I’m careless. How should I proceed? Any advice you could provide would be greatly appreciated. Thanks so much. So far you’ve been doing the right thing, and quite honestly I don’t see any alternative to continuing to send lists of errors. To withhold the errors wouldn’t be right—and in any case, the proofreader will probably notice them later. Your only decision is to weigh the nuisance of sending several lists against the cumulative embarrassment of sending one long one. You might ask your project manager which she prefers. But don’t be defensive or apologetic when you send a list of errors. When I edit a long work, I’m constantly making new corrections in the early chapters, so I know that a certain amount of this is to be expected. And at least you’re catching the errors! 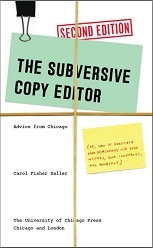 The supervising editor might be impressed that you are so meticulous, honest, and thorough. This might be routine for her. As it happens, I rarely edit in batches, and I don’t send batches to my freelancers, so it’s not something I would normally encounter. I’d love to hear about the experience other readers have had with this issue. I just read your Chronicle column on citation forms—acceptable or otherwise. One of your early examples called to mind a minor irritant of mine. That is, the occasional practice of including the place of publication but not the publisher. I know of no useful knowledge that comes from learning that a book was published in New York rather than Boston. Knowing the city (unless it is, say, Chapel Hill) provides little clue as to who published the book. Academic publisher? Trade book? Self-published? So why bother with city only? I am told by scholars that in some disciplines, it is indeed helpful to know what city (or country) a piece of scholarship originated in, since sometimes research develops in different directions among, say, German scholars and American scholars. They contend that the place of publication can be more meaningful than the name of the publisher, and in their work they often omit the publisher’s name. On my home computer, the antivirus software frequently displays a message, “Your system is secured.” To me, that’s like saying on a shopfront sign, “Everyone is welcomed.” I am positive that the correct message should be “Your system is secure.” “Your system is secured” sounds ungrammatical because “secured” here is and should be an adjective, and the adjective form of “secure” is “secure.” I’ve posed this question on other forums, and some people have defended it by citing the use of a “past indefinite passive voice.” The term “secured” would then be a passive form of verb, but used loosely as an adjective? The verb “secure” is unique in that it cuts both ways. It can refer to the act of taking over a target; or it can mean preventing external acts of acquisition. In the case of computer antivirus software, the term “secured” can apply in two opposite scenarios: (1) The system has been secured by XXXX virus. (2) YYY antivirus software has secured your system against viruses. Of course, argumentative people will just say use your common sense. But to me, the fact that a possible alternative meaning exists means that this is bad communication. My question is: Is the original message “Your system is secured” grammatically sound and totally acceptable in terms of communicative effectiveness, when compared to “Your system is secure”? Hope you can find time to entertain my frivolous questions. I do have time for a frivolous question! Both constructions are perfectly grammatical and commonly used and nearly identical in meaning. The past participle “is secured” serves as an adjective, so it meets your own requirement in that regard. As a copyeditor, I would indeed use my common sense and not spend time worrying about hidden or subtle or unlikely meanings. It’s the sort of thing a grammarian—an argumentative one—might consider in depth, but luckily, I’m not one. What is it about American culture, or education, or religion, that prevents an otherwise normal, intelligent person from concluding without my help that in cases like this you should break one of the rules? A researcher writing endnotes wonders about including the name of the state where a book was published in addition to the city. He wants everything to be consistent (rule 1), and his style guide says not to add the state if it’s obvious already (University of Virginia Press) (rule 2). But if he leaves out all state names for consistency, readers will assume that a book published in London, Ohio, was published in the UK. What to do? An editor working on a bibliography encounters a source who signs all work with an initial instead of a full first name. The rest of the bibliography includes full names. The style manual says to use all full names. What should she do? Well, I want to say, what are our choices here? Make up a name? Delete that source? Change all 437 author names to initials only? Why do they even have to ask? We have the power to break the rule. Of course it’s fine for “What’s the rule?” to be the first question—as long as it’s not the only question. After all, an understanding of the rules is our best tool for getting writers out of tight spots. And note that I said an “understanding” of the rules, which is not the same as an ability to cite them. Understanding the thinking behind a style choice gives you the power both to discard it when better thinking should prevail and to argue for it more convincingly when the reasoning applies. 1. When he presented his plans for the mortuary he told the client he would not start building without payment in advance. 3. Vasquez writes that Stanton and his wife Marie were unhappy, “maligned by marriage” with some of the most prominent families of Houston. —Don’t introduce a quotation in such a way as to land in the middle of a verb (“[would not] build it unless you can agree,” “[was to] be borne by the diners”) or in a way that awkwardly breaks up a modifying phrase (“[unhappily] maligned by marriage”). —Isolate the part of the quotation that’s special, and then don’t do anything to wreck it. “Maligned by marriage” instead of “aligned by marriage” is fun, but in the original quote, it’s blunted by the word “long” tacked in front of it and the lackluster words that follow. —A quotation that is clever or opinionated or shows personality that’s obviously not the writer’s requires attribution right there in the sentence: Vasquez writes; according to Furber. Relegating the source to an endnote isn’t enough. *But remember: extended paraphrasing is against the rules. Taking someone else’s sentences and swapping out every other word for a synonym is just another form of plagiarizing. Many times recently I’ve been distracted by the awkward way in which a writer integrated quotations into the text. But when I try to articulate the problem in order to write about it here, I’m stymied. Allow me to think out loud: what exactly is wrong with the following passages—or is it just me? At the time he presented his plans for the mortuary he told the client he would not start building without payment in advance. Vasquez writes that Stanton and his wife Marie were long “maligned by marriage” with some of the most prominent families of Houston. —Passages that aren’t striking or unique or charged in any way (“one of the oldest of Hyde Park’s apartment houses”) are better paraphrased—or even borrowed wholesale—without quotation marks. The original writer doesn’t have a copyright on pedestrian prose. —Don’t start a quotation in the middle of a verb (“[would not] build it unless you can agree,” “[was to] be borne by the diners”) or other modifying phrase (“[long] maligned by marriage”). —Isolate the part of the quotation that’s special, and then don’t do anything to wreck it. “Maligned by marriage” is a great phrase, but in the original quote, it’s blunted by the word “long” tacked tin front of it and the lackluster words that follow. —The sources of all the quotations above were named in endnotes, but that isn’t adequate when a quotation is clever or opinionated or shows personality obviously not the writer’s. Those quotes require attribution right there in the sentence. Soon after I wrote about recording a macro to type an en dash, my friend and colleague Russell Harper wrote to me, as he often does after I venture into giving technical advice, to point out how I might have done it better. Don’t get me wrong—Russell is the most humble smart person I know. He never intends to make me feel bad, and he never does. It’s one of his many gifts, knowing how to make a person feel just fine about not knowing as much as she could. Russell is familiar to readers of this blog as my go-to tech guy. I’m always, always, tempted to run a tech post by him ahead of time, but I don’t always, because the thing about having a tech-savvy friend who has a different, actual job—and a family, and a life—is that you have to save him for when you’re desperate so as not to become a nuisance. I save Russell for questions that I know he won’t be able to resist (I hope he’s not reading this), either because I know he will really want me to know the answer or because (and this is rare) he doesn’t know the answer himself. Yet. So back to the macros. Russell thought I did fine in explaining how to use Microsoft Word’s macro-recording feature, but he wanted to point out that the example I used—that of making a shortcut key for an en dash—could actually have been accomplished in a much faster way without the use of a macro. My goal of making a shortcut key for an en dash came about because my new laptop lacks a numeric keypad, so the usual Control-hyphen for typing an en dash isn’t an option. Assigning the keyboard command Control-hyphen to a macro that grabbed an en dash from the Symbols menu was a good solution. In a Word document click on the Insert menu. Choose Symbol > More symbols. Click on the Special Characters tab. Click on Shortcut Key . . . In the new box, put your cursor under Press New Shortcut Key and hit Control-hyphen. If you already knew this but, unlike Russell, haven’t written to point it out, it might be because you assumed that it was beside the point, and that I chose the en dash because it was ideal for making a basic macro, not because I didn’t know about this easier way. Unfortunately, you would have been wrong. I hope you used my macro lesson to record a simple shortcut for a time-consuming mechanical task you do often. I also hope that you will always, like Russell, feel free to comment or email me about anything useful. It’s how I learn things.